One tiny figure of the Queen surrounded by all that maritime pomp and ceremony. In this series of cityscapes, I’m telling stories of London occasions like the Royal Wedding, so how could I make the Queen the centre of this ‘story’ on her Thames barge, that Jubilee day? 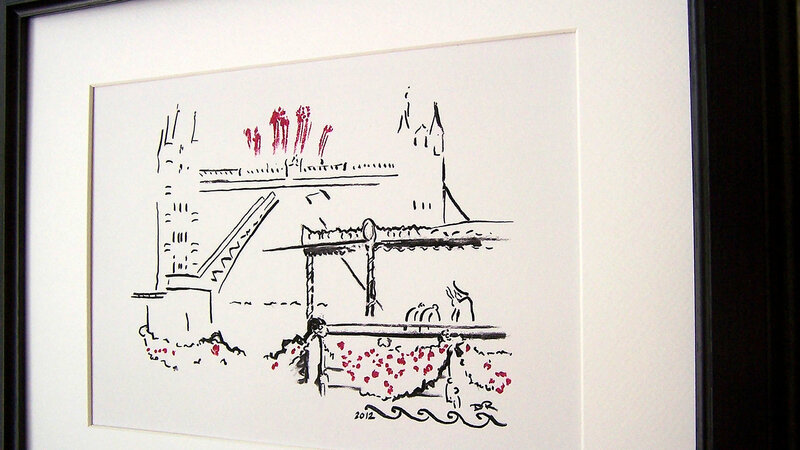 Even though I’ve drawn Tower Bridge in detail before, I had to lessen its appearance in this artwork, so that she and the barge would not get upstaged. I feel it actually really works in that it looks like it’s emerging out of the driving, London rain that afternoon. I did enlarge the opening bascules though, in order to help tell what was happening. 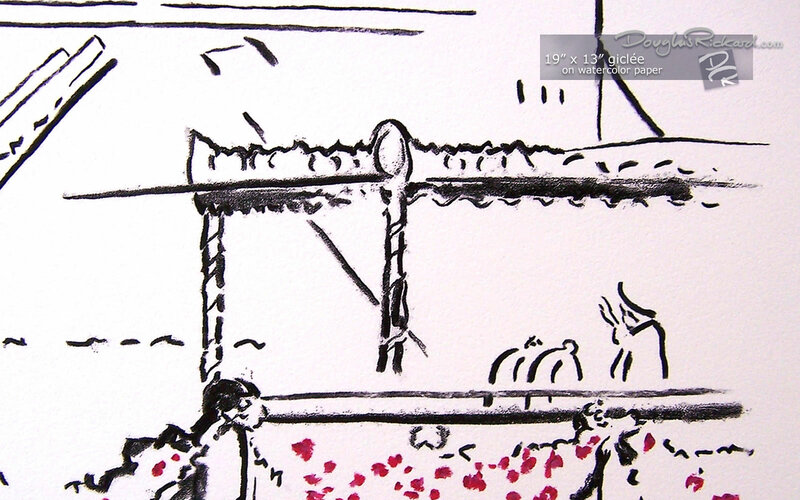 To this minimalist charcoal art I added color for the garlands of roses, peonies and carnations on the Royal barge, in the shape of rolling waves. See how the iridescent, “red gold,” real oil pastel touches shine in the 13” x 9.5” Hand Embellished version, a Numbered Limited Edition of six, along also with the 13” x 9.5” and 19” x 13” versions. So if you’d like one, don’t leave it too late and miss the barge, will you! 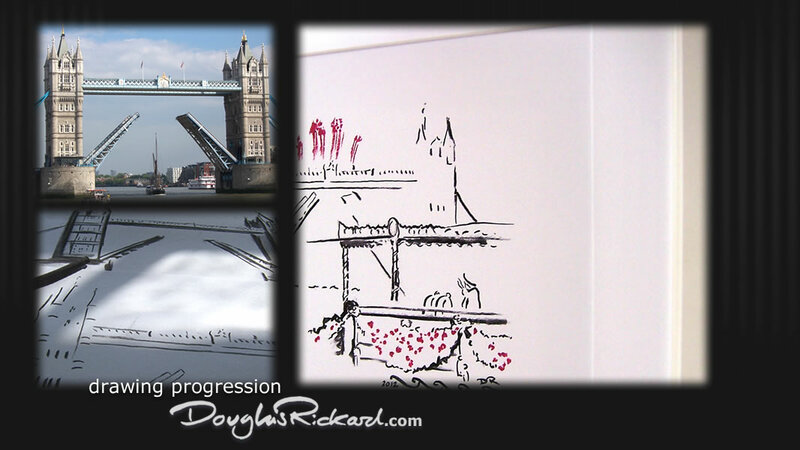 Douglas Rickard drew a minimalist Tower Bridge for his Queen’s Jubilee art. On a rainy Queen’s Jubilee weekend, the cheerful color of fireworks in the London sky, atop a just-visible Tower Bridge. 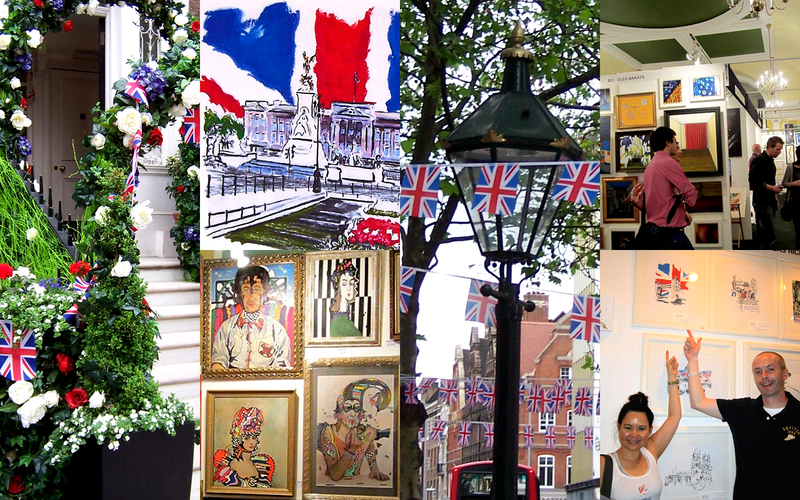 ‘Red gold,’ real oil pastel touches shine in this Hand Embellished Queen’s Jubilee art by Douglas Rickard. The Queen’s Diamond Jubilee River Pageant by Douglas Rickard. 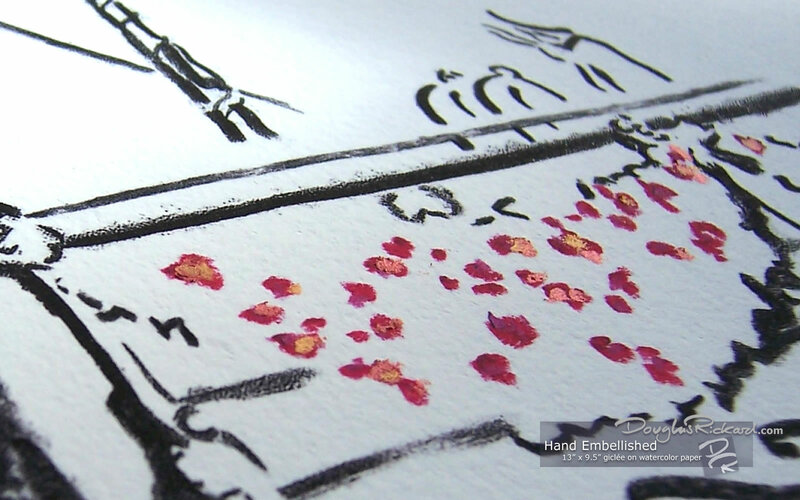 This Numbered Limited Edition of six in three versions is out on Thursday, so to wet your appetite, (as if the actual River Pageant wasn’t wet enough that day already,) here’s my video about my latest royal art!